French painter. After the death of her mother in 1775 she left Grasse to join her elder sister Marie-Anne and her sister s husband Jean-Honor Fragonard in their quarters in the Louvre in Paris. Marguerite became Fragonard s protg and lived for the next 30 years in the Louvre, where she was exposed to the greatest art and artists of the past and present. By 1785 she had already established a reputation as a gifted genre painter, the first French woman to do so, and by the late 1780s came to be considered one of the leading women artists in France, the equal of Adelaide Labille-Guiard, Anne Vallayer-Coster and Elisabeth Vige-Lebrun. Although she also produced oil portraits, portrait miniatures, and etchings, Marguerite Grard is best known for her intimate domestic genre scenes. By her mid-twenties Grard had developed her signature style, which featured painstakingly accurate details rendered with subtly blended brush strokes, both traits borrowed from 17th-century Dutch genre specialists, notably Gabriel Metsu. Grard s work is not only technically impressive but also practical: these relatively small-scale, portable canvases were designed to appeal to wealthy collectors who preferred to display in their homes meticulously painted still lifes and genre scenes rather than large history paintings. 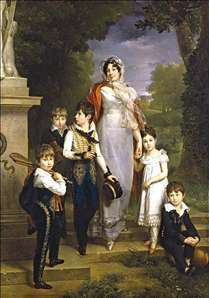 The numerous engraved versions of Grard s paintings made them accessible to less affluent art lovers and helped increase her reputation. 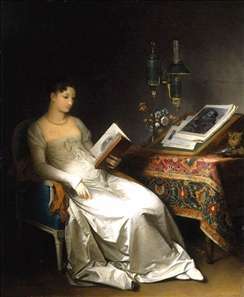 See more details about "Lady Reading in an Interior"
See more details about "Portrait of Maréchale Lannes, Duchesse de Montebello with Her Children"